Fish tanks are known commonly as aquariums and they mostly come in cuboids shapes. Fishes and plants are kept in this artificial living habitat for display purposes at home. Thousands of people have adopted the hobby of keeping fishes. If you are wondering how to build a fish tank yourself, this might be an informative article for you. First, set your mind on the type or specific sepsis of fish that you would like to have. Different species requires different setups like salt water, water temperature and size of the tank. Get an aquarium kit that fits perfectly into the place that you plan to place the fish tank. Building a fish tank is quite easy as there are aquarium kits available in most of the aquaria. Scrub and clean your tank with hot water without soap in order to get rid of bacteria and dirt. Place the tank at a suitable place away from crowds or direct sunlight. Then, place the sand or gravel at the bottom of the tank followed by the installation of your water filter, heater (if required), decorations, driftwood and plants. Make sure that the aquarium is not over packed so that your fishes will have a larger habitat. 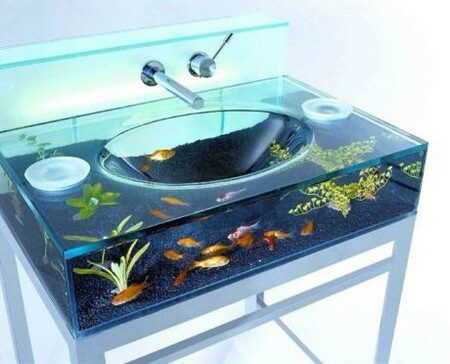 Place decorations that provide hiding place for your fishes. Get a water filter appropriate to the size of your tank to ensure that there is sufficient oxygen supply in the water for the fishes. Set up the water filter at one corner of your fish tank. 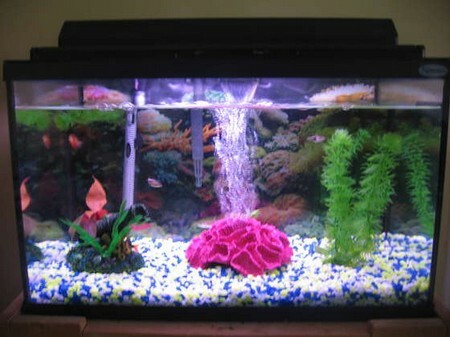 Fill in water to the top of the tank so that your fishes will have larger space. Set the water to the optimum temperature required for your choice of fishes and remember to treat the water with chloramine solution to remove chlorine from the water. Adjust the pH level of the water according to the species of fishes. Salt water fishes require hard water, and fresh water fishes live in soft water about pH 7. Those are the basics of how to build a fish tank. But before you put in your fishes and corals, leave the fish tank after switching on the water filter and heater to run for at least a week. This allows the tank to mature and speeds up the curing process of live rocks. You can also consider putting on lights. The lights have the function of artificial sunlight to stimulate the growth of algae. Algae are a good food source for fishes so it is important not to over clean your fish tank.